Pouring Concrete over the floor is not a job just left for the experienced professional. You can do it yourself if you have that skill and related tools, this can help you in saving the money. But if you want your concrete floor to be the best in quality, go with the builders or contractors. However, learning the skill and getting the required tools are not very difficult. You can learn it easily and get tools on rent. If you want to pour it by yourself then you will get a standstill because if anything goes wrong then it would be extremely expensive to repair. Pouring the concrete over the floor is not a “piece of cake”. Concrete flooring can be used for homes, parking lots, sheds, etc. 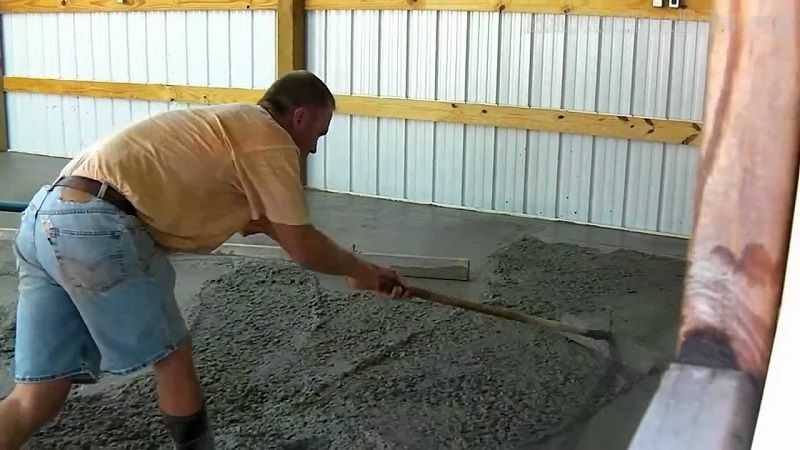 “Confused?” if you want to do it yourself or get it done by professional, go through the concrete floor pour process mentioned below. #1. “Time and Budget” Many people don’t consider this before starting the actual job. If you don’t give these a consideration then you may end up having scarcity of time or paying more. #2. Job Site Preparation is the main process before pouring the concrete on the floor. Dirt would be there on the soil or floor that might not help the concrete to withstand. Compact the job site and level it for an extensive life of concrete flooring. #3. Once the floor has been cleaned, prepare a base on which you are going to pour the concrete. Sometimes, soil can also be the base if it is compacted and leveled thoroughly. #4. After preparing the base you should prepare a form because concrete is a semisolid material which can’t stay without any support. The form would generally be prepared from wood and within that structure, you should make wire mesh so that concrete can stay within the wooden formed structure. #5. Mix the concrete using cement, sand, water, gravel, etc. you should make a strong quality mixture which gives strength to the floor. Put the material into the mixture machine to mix it well for concrete floor pour. #6. Once the concrete is mixed pour the mixture into the created form. Get some pipe if the required area is far from the mixture machine. Involve some crew to spread the mixture throughout the form. #7. Screed the Mixture well and make the surface plane using the plane board. Flat and make the surface plane properly, any mark or ups and downs on the surface should not be there. #8. After flattening the surface you should make control joints with a groover. Concrete can withstand cracking because of temperature changes. #9. Using a broom sweep across the surface to create traction. This makes the concrete surface look good because by sweeping you can create some designs. Don’t sweep deep because that can cause water to stand on the surface. #10. Curing the surface is also important because this gives strength to the surface. Surface can be cured using sealant. #11. Concrete surface is considered as strong surface still you should maintain your concrete from cracks or getting distressed. You should repair your surface before you see any cracks to get the extended life of your surface. Unless you pour the concrete on the floor properly and maintain it you won’t get the extended life of your surface. How much attention you will pay while pouring and maintaining that much extended life your surface will get. 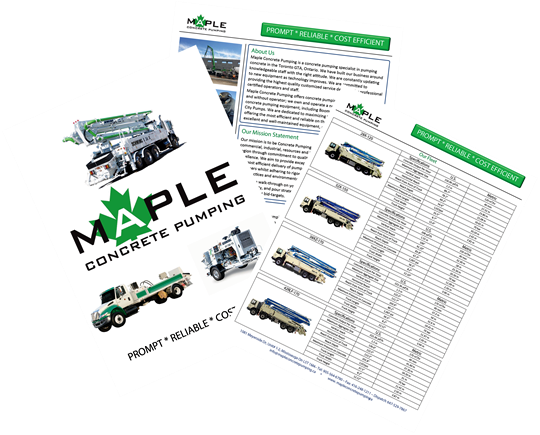 Maple is a leading company of Toronto, Ontario which delivers its outstanding concrete pumping services from a decade. It is successfully running with thousands of satisfied customers. We have both home owner and contractors. This is What, We Do! We assure you to deliver the best and durable Concrete Floor Pour services at very competitive price.